God said that, this format is of love and I give you this statue. Keep it with you every time, serve it and disappeared after saying this. Shri Narayan Bhatt ji walked to braj with lord statue. After some time he arrived at Radha kund, in journey lord talked with him like a child and became statute again when any person arrives. Madan Mohan appeared in front of Brahmachari. Like this, Narayan bhatt ji started learning mystery community. 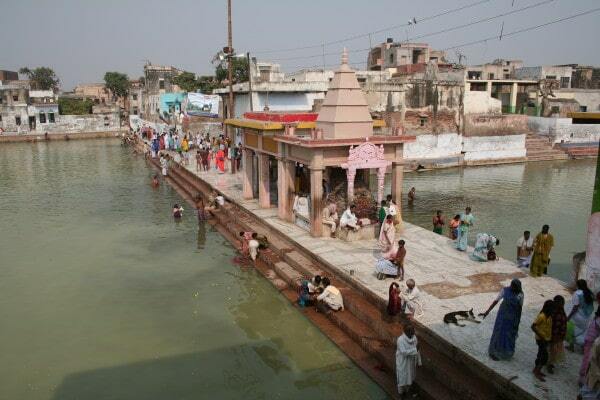 Left side Radha kund and right side Krishan kund in picture. Shri Brahmachari gave Gopal mantra to shri Narayan bhatt. He did saved Braj pilgrim group after studying the scriptures. Then he lived at Guru home in Radha kund and created many texts. Then a few days later he started living uche named village near barsana. There he expressed shri Baldev ji. "Today, the statue of shri Baldev is there in Uche village." Someday he worshiped shri Baldev ji in Ucha village. At the same time, shri Radha ji inspired him. So Shri Narayan bhatt went to Gahavar forest and started meditation of Radha ji. Shri Narayan bhatt started meditation of Radha ji in Gahavar forest. Radha ji graced him. She appeared in front of him and gave him own statue. When shri Narayan saw Gopi form then shri Radha ji appeared in front of him. Her foot was very soft. Then Shri Narayan bhatt added his both hands and he got successful by Radha grace. Radha ji said that my statue is on bharhmachal mountain and her name was laadileelaal. Then he took Radha ji from there and started serving. Shri Narayan bhatt made two small cottage on the bhrahmachal mountain. In one cottage Radha ji lived and in another cottage Narayan bhatt himself lived and started serve her. Devotees began visiting from villages. Gradually information about Radha started spreading. Devotees were making their life happy by saying Radhe-Radhe. After some time Shri Narayan Bhatt ji gave charge of Radha ji service to his beloved disciple "Shri Narayandas ji shroti" and himself started living Uche village for Baldev worship. Shri Ji (Radha ji) was expressed at samvat 1626 (1569 year) on Aashaadh Shudi Dauj. From that time onwards child of Shri Narayandas ji shroti started worshiping Radha ji. Meanwhile, Shri Narayan bhatt ji built Baldev ji temple, did construction and renovation of ancient temples and reservoir group from Emperor Akbar treasurer. Shri Bhatt ji created 52 texts and he started creating children as Radha-krishan. One day he saw statue of shri Radharaman in sanket village. As per their order, a Rasikalhadinee text was created of whole Bhagwat. Then old leela was started and it is still happening from saptami to teras tithi in Bhadrapad month. Afterwards, devotees started journey of braj. Braj journey started from him, two texts was created for this. (1)Brajbhkti villaas (2)Vrihat braj gunotsav. When all the work was completed then he requested to disappear. Then after giving all charges to the son Damodar Bhatt Goswami Ji on Janmashtami Day, Narad ji got disappeared in the presence of thousands devotees and disciples. It is estimated that this time was prior to Samvat 1700.